Western blot analysis of extracts from various cell lines using CD86 (E2G8P) Rabbit mAb (upper) or β-Actin (D6A8) Rabbit mAb #8457 (lower). 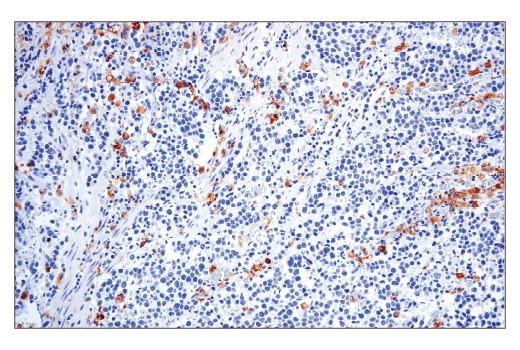 Immunohistochemical analysis of paraffin-embedded human lung adenocarcinoma using CD86 (E2G8P) Rabbit mAb performed on the Leica® BOND™ Rx. 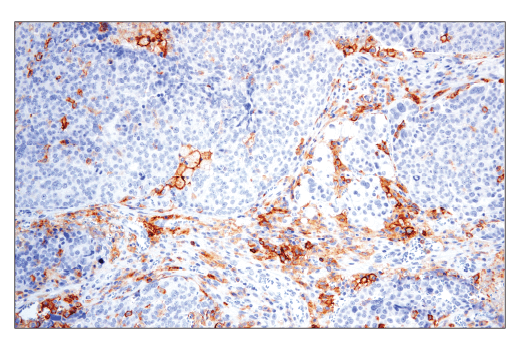 Immunohistochemical analysis of paraffin-embedded human gastric adenocarcinoma using CD86 (E2G8P) Rabbit mAb performed on the Leica® BOND™ Rx. 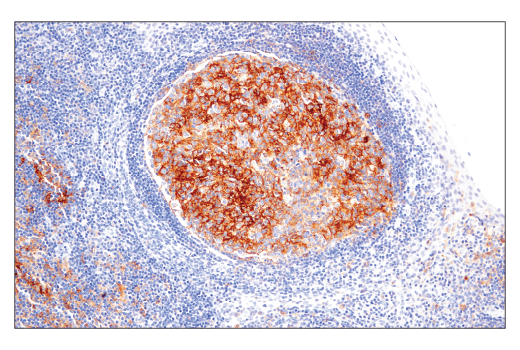 Immunohistochemical analysis of paraffin-embedded human tonsil using CD86 (E2G8P) Rabbit mAb performed on the Leica® BOND™ Rx. 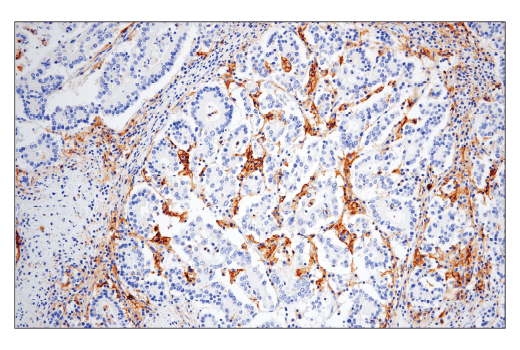 Immunohistochemical analysis of paraffin-embedded human ovarian serous carcinoma using CD86 (E2G8P) Rabbit mAb performed on the Leica® BOND™ Rx. 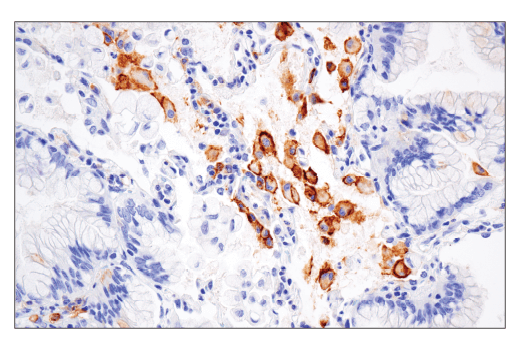 Immunohistochemical analysis of paraffin-embedded human colon adenocarcinoma using CD86 (E2G8P) Rabbit mAb. 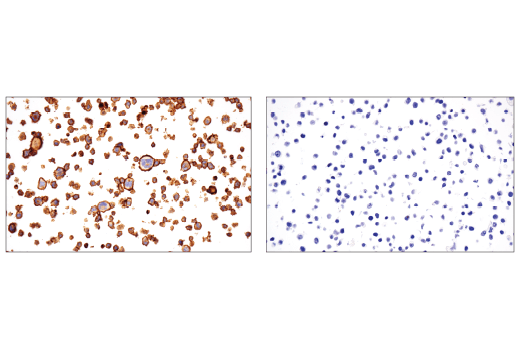 Immunohistochemical analysis of paraffin-embedded HDLM-2 cell pellet (left, positive) or HT-29 cell pellet (right, negative) using CD86 (E2G8P) Rabbit mAb. 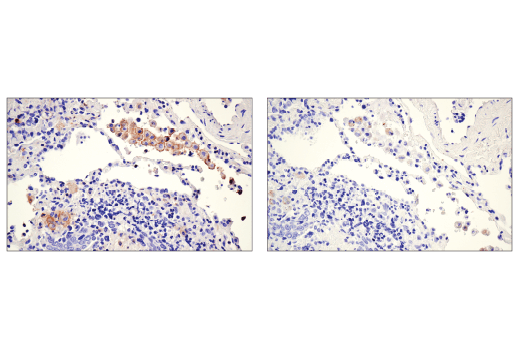 Immunohistochemical analysis of paraffin-embedded human lung adenocarcinoma using CD86 (E2G8P) Rabbit mAb (left) compared to concentration matched Rabbit (DA1E) mAb IgG XP® Isotype Control #3900 (right). Confocal immunofluorescent analysis of HDLM-2 cells (left, positive) and HT-29 cells (right, negative) using CD86 (E2G8P) Rabbit mAb (green). Blue = Hoechst 33342 #4082 (fluorescent DNA dye). 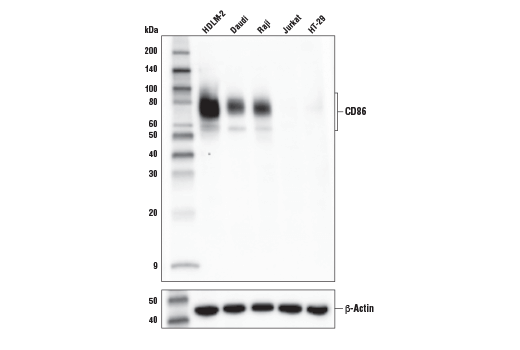 CD86 (E2G8P) Rabbit mAb recognizes endogenous levels of total CD86 protein. 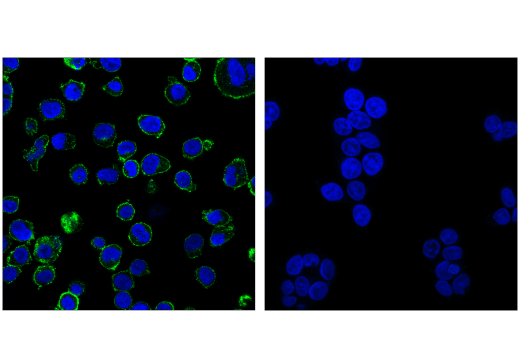 Monoclonal antibody is produced by immunizing animals with a synthetic peptide corresponding to residues surrounding Pro239 of human CD86 protein. CD80 (B7-1, BB1) and CD86 (B7-2, B70) are members of the B7 family of cell surface ligands that regulate T cell activation and immune responses. CD80 is expressed on activated antigen presenting cells, including dendritic cells, B cells, monocytes, and macrophages. CD86 is expressed on resting monocytes, dendritic cells, activated B lymphocytes, and can be further upregulated in the presence of inflammation (1-3). CD80 and CD86 are ligands for CD28, which functions as a T cell costimulatory receptor. Interaction of CD28 with CD80 or CD86 provides the second signal required for naïve T cell activation, T cell proliferation, and acquisition of effector functions (3-7). Alternatively, CD80 and CD86 also act as ligands to CTLA-4, which results in the downregulation of T cell activity (3,7-9). Freeman, G.J. et al. (1989) J Immunol 143, 2714-22. Azuma, M. et al. (1993) Nature 366, 76-9. Adams, A.B. et al. (2016) J Immunol 197, 2045-50. Linsley, P.S. et al. (1990) Proc Natl Acad Sci U S A 87, 5031-5. Gimmi, C.D. et al. (1991) Proc Natl Acad Sci U S A 88, 6575-9. Harding, F.A. et al. (1992) Nature 356, 607-9. Collins, A.V. et al. (2002) Immunity 17, 201-10. Linsley, P.S. et al. (1991) J Exp Med 174, 561-9. Krummel, M.F. and Allison, J.P. (1995) J Exp Med 182, 459-65.